Hemp fiber has been well known throughout much of history for its strength and durability in a variety of uses such as rope and high quality paper, canvases and textiles dating back several thousand years to early India and China. Today, hemp fiber is primarily used in the manufacture of specialty papers, such as cigarette paper and bank notes, and as a composite replacement for fiberglass. Hemp fiber can also be used to manufacture automobile interior assemblies, dashboards, door liners, consoles etc. 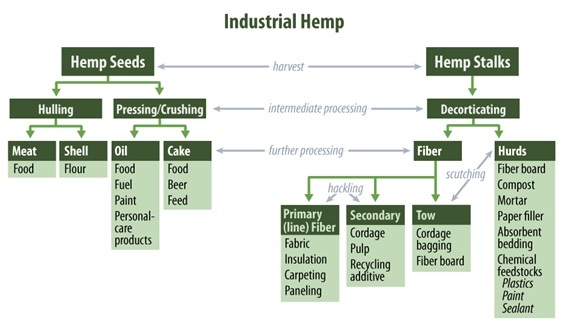 Industrial hemp is an agricultural commodity that is cultivated for use in the production of a wide range of products, including foods and beverages, cosmetics and personal care products, and nutritional supplements, as well as fabrics and textiles, yarns and spun fibers, paper, construction and insulation materials, and other manufactured goods. Hemp can be grown as a fiber, seed, or another dual-purpose crop. Some estimate that the global market for hemp consists of more than 25,000 products. Precise data are not available on the size of the U.S. market for hemp-based products, but current industry estimates report annual sales at more than $580 million annually.